Editor’s Note: Featured is another installment in our occasional series of fascinating cross-postings from the blogs published by various libraries and archives. Today’s post comes from Out of the Box: Notes from the Archives @ The Library of Virginia, and was authored by Sarah Nerney, senior local records archivist. 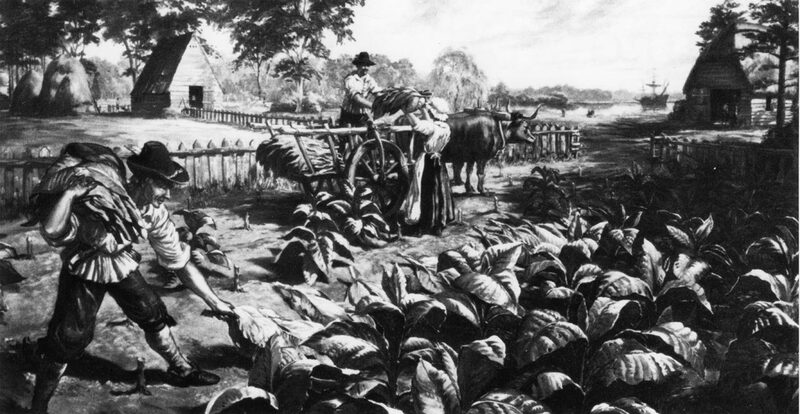 Virginia’s agricultural production, as well as its economy, was dominated by tobacco for over three centuries, ever since John Rolfe sent his first shipment of tobacco to England in 1614. Growth of the Virginia colony and extension into the interior meant more soil and larger crops of tobacco. Despite the continuous growth in production, the tobacco trade was plagued by falling prices and decreased quality. By the 1720s, tobacco exports included large quantities of inferior product that even included shipments of “trash” tobacco—shipments that diluted tobacco leaves with foreign substances such as household sweepings. Consequently the price of tobacco sank so low that many planters struggled to recover production costs. Tobacco growing in the streets of Jamestown. From Robert K. Heimann, Tobacco and Americans (1960). Image courtesy of Library of Virginia Special Collections.